Windy: Hey, Tinker? How do you spell "Mare Nostrum?" Windy: The Mediterranean. It's what the Eye-ties call it. It means "our sea." Windy: I'm writing to my sister. Tinker: Whattya mean, you're writing to your sister? You're packed on a landing barge, bouncing on your Mare Nostrum, and waiting to hit the beach like the rest of us slobs. I first saw "A Walk in the Sun" as a child. It was one of the first VHS recordings I bought, and I also have a DVD copy. I have always regarded it as one of the most authentic depictions of small-unit actions of the period. 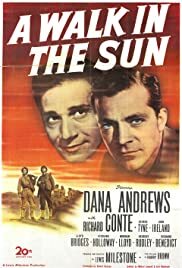 The cast is excellent, and - although the language is toned down compared to post-1960s films, as with Richard Conte's character using the expletive "loving" where a more recent film would use a cruder synonym - one has the sense of being there with the group of GIs, with the same constricted vision of what is happening. This is not a grand epic. It is not the more modern grittier down-and-dirty story; but it is as close to what happened to the platoon depicted as a 1945 movie could get. It does not glamorize the war; but neither does it hyperbolize visually or verbally to denigrate the conflict. Critics, I am sure, would say many better films have been made since. I am not so certain of that. I am certain that this is one of my favorite films.